The Olivier Awards, the British equivalent of Broadway’s Tony Award, are being presented Sunday in London at Covent Hall. 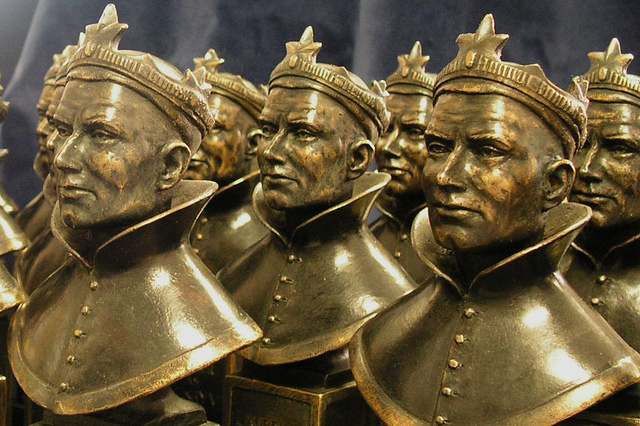 The Olivier Awards for the best of the best in British theater are being awarded Sunday night. The event takes place in Covent Garden’s Royal Opera House and will be hosted by comedian Lenny Henry and feature live performances. Best Actress in a Musical nominees Beverley Knight and Katie Brayben will perform numbers from “Memphis The Musical” and “Beautiful – The Carole King Musical,” respectively, “Cats’ ” Nicole Scherzinger will sing Andrew Lloyd Webber’s “Memory,” while “Here Lies Love’s” Natalie Mendoza will perform with the show’s composer David Byrne. For a list of the 2015 nominees, click here. Of course, the awards are named after the great Births actor and director Laurence Olivier (1907-1989) who also is a founder of the National Theatre Company. In 1984 Olivier agreed to give his name to the awards. Visit the Laurence Olivier page for a full biography. Follow that night’s events on Twitter at #Oliviers. You can also watch a live stream of events from the ceremony at the Covent Garden Piazza event.